Total Socials: 10 creative ways to use Instagram for business. 10 creative ways to use Instagram for business. Are you thinking about putting your business on Instagram? Are you looking for content ideas for this increasingly popular mobile social platform? Read further to discover how you can use Instagram to give your business extra visibility and better engage with the Instagram community. Instagram is a free mobile photo-sharing app with 80 million users and counting. It has seen many changes lately. Instagram was acquired by Facebook in April 2012, launched a redesign on iOS that includes a new “Explore” tab and is rumored to be developing a web presence (so that users can see photos online, not just on the mobile app). A view of Instagram's interface in iOS. Social media management platform HootSuite also recently announced the addition of Instagram to its app directory. This gives HootSuite users access to almost all of Instagram’s features, which include searching, viewing and liking content, adding comments and sharing photos to other social platforms. Clearly, Instagram is an up-and-coming photo-focused social platform not to be ignored. So what can your brand do with it? Here are 10 creative ways your business can use Instagram. Everyone loves to browse products, so let your followers do some mobile window-shopping! Show off a collection of the products you offer, share a photo of a new or lesser-known product or zoom in on a product and engage your Instagram followers by asking them to guess what it is. Show off some of the equipment and supplies that play a role in the services you provide. For example, fitness trainers could show off their favorite workout equipment, photographers could reveal their most prized camera lens and mechanics might give us a look at their most sophisticated diagnostic equipment. 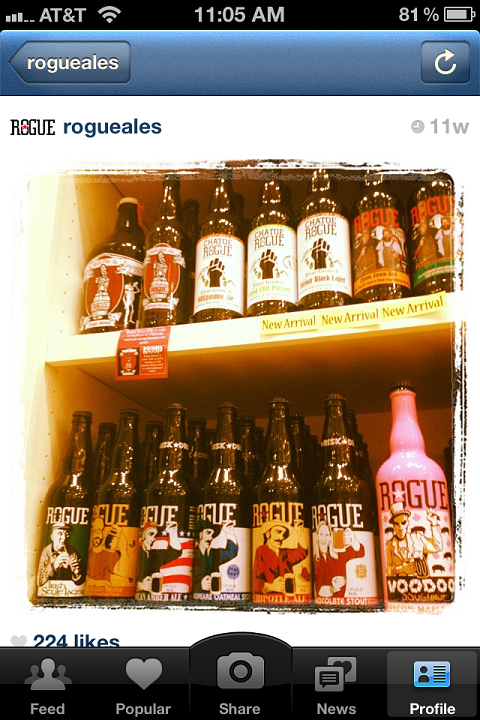 Rogue Ales, a craft brewery based in Newport, Oregon with over 3,000 Instagram followers, shared a photo of its many varieties of ales, porters, lagers, stouts and spirits, effectively reminding fans that they have something for everyone. Rogue Ales shows off its beer selection. The longevity of the show How It’s Made is a testament to our curiosity about where our manufactured goods come from. Let followers in on the origins of their favorite products with snapshots taken at various points in the manufacturing process. If that process is a long one, you might consider making it a multi-part post that follows the process from planning to production to delivery. Bloomington, Indiana-based Oliver Winery used another app such as PicStitch orPhotoGrid to create a collage of photos to demonstrate how its wine goes into its bottles. 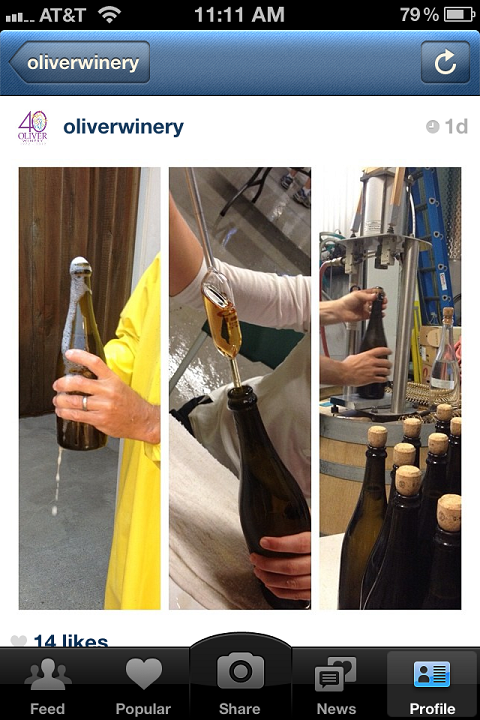 Oliver Winery takes its Instagram followers through its bottling process. Getting ready to launch or promote products and services is hard work, but presents many opportunities to get some great content for Instagram. Doing a photo shoot for a catalog or ad? Filming a commercial? Getting made-up for a media interview? Or getting ready to step out on the red carpet? These are moments that very few people get to experience in real life. Think of Instagram as a way to give all of your followers an exclusive backstage pass! The fashion-forward retailer Nordstrom treated its 27K Instagram followers to a rare look at what goes into the production of its catalog. 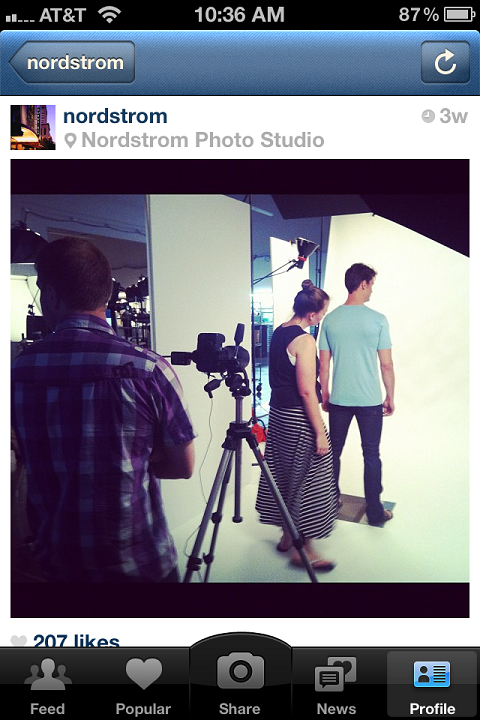 Nordstrom takes fans along on a photo shoot. Sometimes our imagination only takes us so far. Use Instagram to create demand by helping consumers imagine new or novel uses for what you offer. This is also a perfect opportunity to invite user-generated content. Have fans submit their own photos demonstrating creative use of your products and pick the best ones to post on Instagram. If your business provides a service like makeup or hair design, landscaping, decorating, auto body repair or interior design, show your Instagram followers the impact of your work with a shot of your subject before and after you work your magic. The side-by-side comparison will add the wow factor to your Instagram content and maybe even get you a few new customers. Cosmetics retailer Sephora used Instagram to spotlight an unusual product that most of us do not have in our makeup bags, giving followers a better idea of how it might look out of the package and on someone’s lashes. 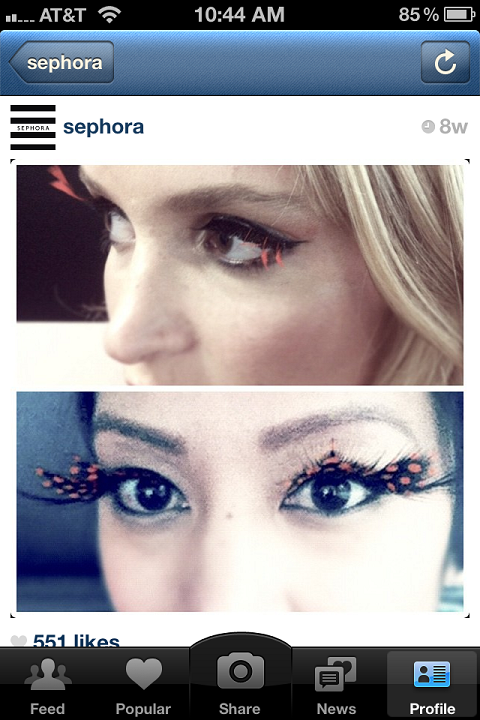 Sephora helps makeup enthusiasts imagine what it would look like to don lashes with spots and highlights. Everyone likes to be the first to know… well… anything. Make your Instagram followers feel special and give them exclusive previews of products and services, or virtual tours of your new stores, production facilities or offices in the making. Things never seen before make for particularly shareable content, so be sure to publish the post to Facebook and Twitter as well, since Instagram does not yet have a sharing or reposting function. Makers of rugged bags and footwear Keen posted a picture of its future headquarters in the midst of construction to satisfy the curiosity of those who might be wondering where their favorite shoes will be coming from. 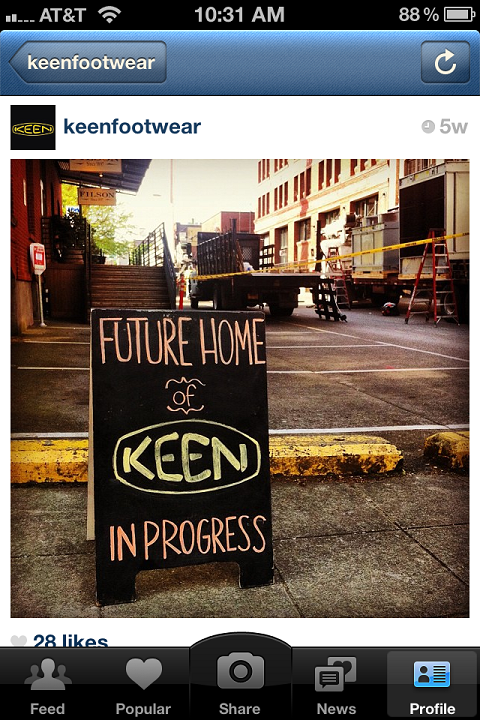 Keen shows off its future home. People who follow their favorite brands on social media have probably asked at one time or another, “I wonder what it’d be like to work there?” Well, show them! Post photos that provide a glimpse of a-day-in-the-life at your office—work areas, the corporate gym or play-field, decked-out cubicles, brainstorming meetings in progress, training sessions, employees at lunch, employees at play—the opportunities here are countless. If you’re hiring, be sure to point people to your online job postings in the caption. Beloved online shoe store Zappos shows fans that even its employees work in cubicle-land, albeit a very fun, colorful one that matches its friendly brand personality. 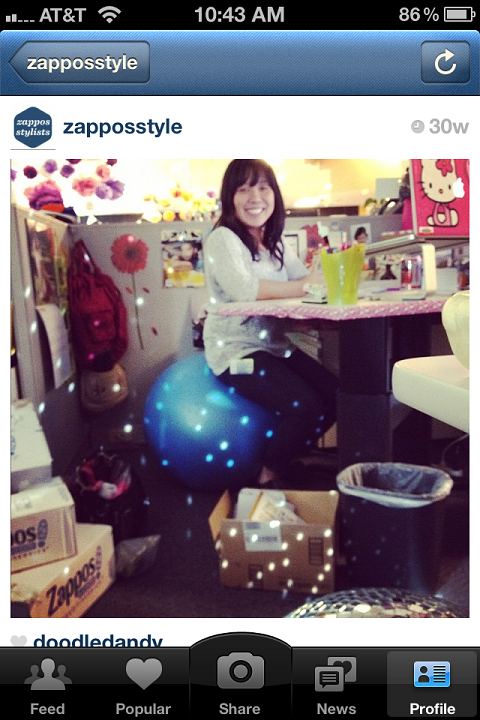 Zappos shares a glimpse of its colorful workspace. Going to a trade-show or sponsoring an event? Use that as an opportunity to take your Instagram followers with you wherever you’re going. Followers in those locations will be tickled to know you’re in their neighborhood. Folks can also get a better feel for your brand by learning about the events or causes you attend, support or sponsor. Major League Soccer team the Seattle Sounders gave fans an off-field glimpse of its players doing something quite ordinary, standing around waiting at an airport with luggage in hand. 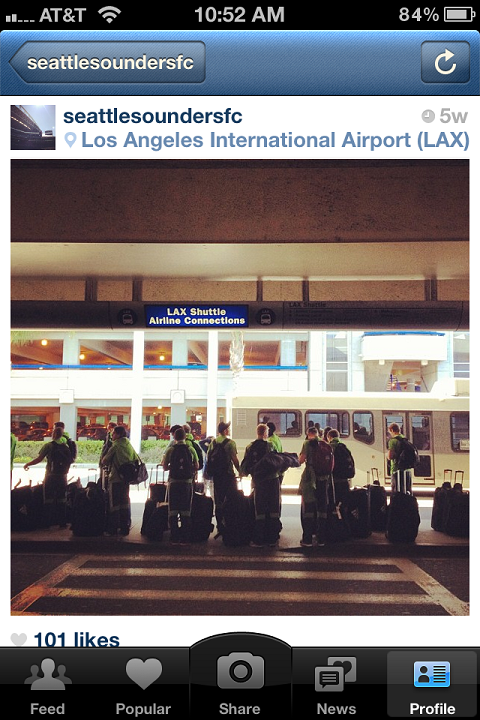 The Seattle Sounders soccer team takes its fans along to LAX. 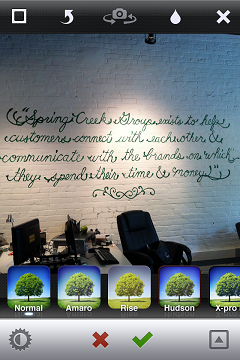 Humanize your brand by using Instagram to introduce your fans to the people who make your company what it is. Spotlighted employees will enjoy the recognition (and a few seconds of fame) and Instagram followers will get a chance to see the people behind the brand. You might even want to make this profile an ongoing campaign that takes fans around the office to meet staff serving a variety of roles within your company. Be sure to punch up the post and share a little about each employee in the caption. 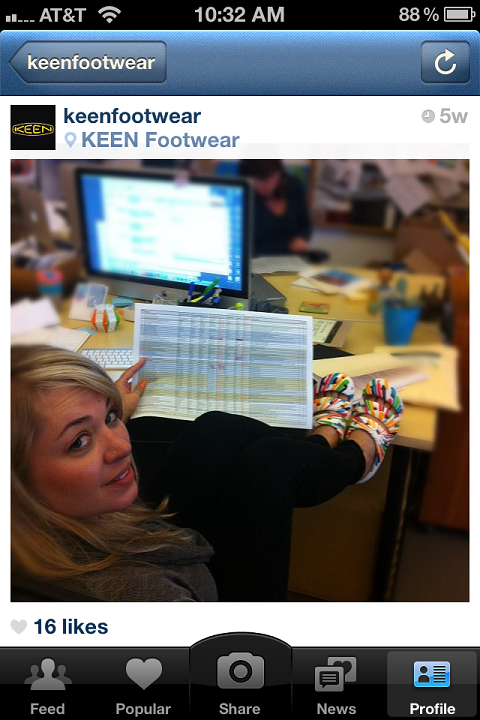 Keen put a human face to its brand with a shot of a spreadsheet-wielding employee. Let’s face it. We live in a society that is crazy about celebrities—we know who they’re dating, what they’re eating and where they go to vacation. Cash in on celebrity cachet and share pictures of them interacting with your brand, whether they’re signing autographs at your sponsored event, speaking, visiting your office or even using your products or services. These posts will be sure to get followers talking. Sony Electronics shared a photo from a celebrity appearance at an Xperia event to grab the attention of Maroon 5 fans on Instagram. 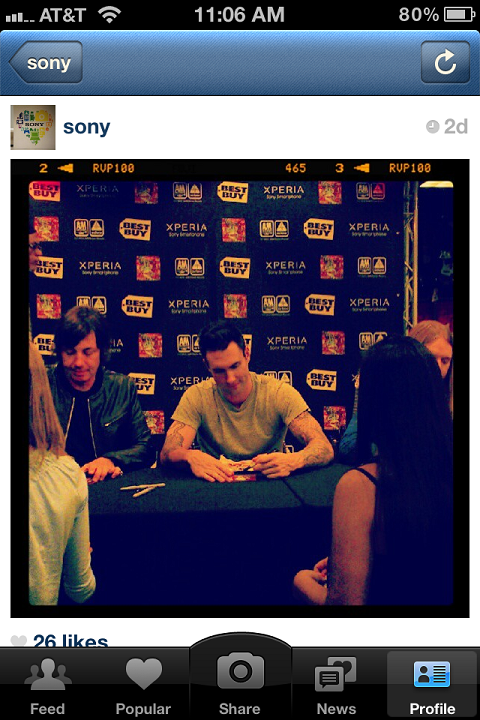 Sony shares a shot of Maroon 5 signing autographs at one of its events. There is no denying the appeal of animals in social media. Lolcats, Cute Overloadand the countless other awwwww-inducing blogs out there are proof that there is capital in cuteness. Whether they’re pets visiting the office, starring in your ads or animals sporting your schwag, never miss an opportunity to get a snapshot to share on Instagram. Our furry friends can be counted on to get likes and comments from followers. 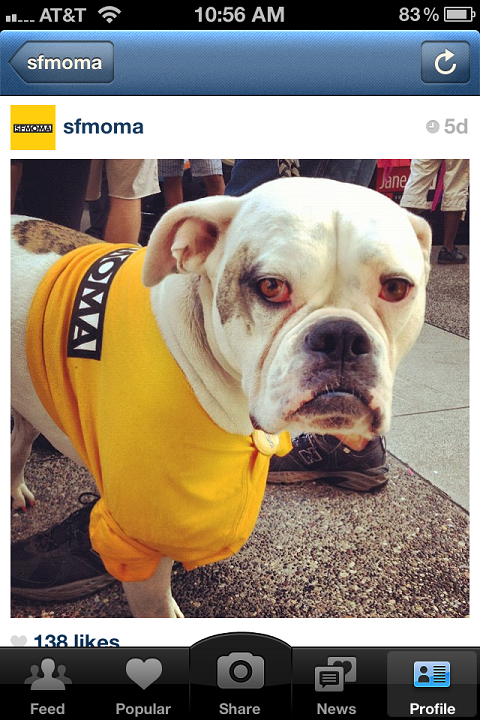 The San Francisco Museum of Modern Art gave its followers the warm fuzzies (and collected many likes) with a photo of a dog sporting an SFMOMA t-shirt. post originally taken from http://www.socialmediaexaminer.com/instagram/ and we are not claiming this content as our own.